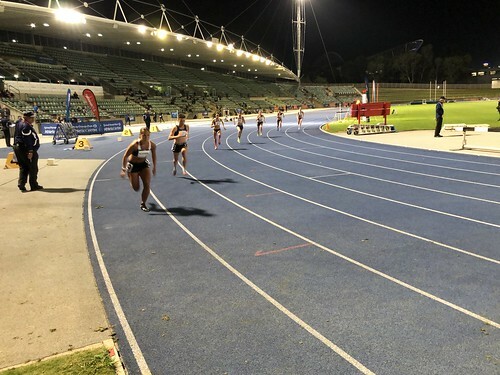 A strong team of Melbourne University students are in action over four days for the 2019 UniSport Nationals Athletics. The competition serves as a selection trial for the upcoming 30th Summer Universiade in Napoli. In Day 1 competition Isabelle Napier cleared 3.70m for bronze in the Pole Vault with Emily French getting 5th (2.60m). Montana Breruldsen claimed 6th in the 400m hurdles (67.63). Athletes backed up from the 100m and 200m heats for the medley relays with Kat Anderson, Emily French, Montana Beruldsen and Jamieson Battistella winning sliver behind Sydney University. The men, Dhilan Chandrasekara, Stephen Liu, Jasper Sheehan and Riley Womal took 5th place in a deep field. Friday saw Joseph Baldwin win the high jump with a 2.10m clearance and three good attempts at 2.15m. Olivia Jones claimed bronze in the HJ (1.70m) with Jamieson Battistella 6th (1.65m). Cass Wang Lecouteur recovered from a shaky start to get 6th in the 100m final. Riley Womal qualified for the final of the 400m and ran 1.59 to take 7th in the 800m. Catriona Bisset, recently crowned national champion, and Chui Ling Goh both qualified for the final of the 800m on Sunday. Montana Beruldsen stepped up to contest the 400m after her 400m hurdles the night before. Jamieson Battistella and Jasper Sheehan, freshly named in the Australian U20 team for the Oceania Championships, were in action on Saturday, along with a passel of other Melbourne University stars. Georgia Hansen crowned the night with an impressive 4:11.22 personal best, coming second in the 1500m behind Georgia Griffith, her training partner, and claiming a Universiade qualifier. Katrina Anderson came through strongly at the end to win the bronze. Jaryd Clifford took silver in another quality men’s 1500m just behind Callum Davies. Both 4x100m relay teams, ably drilled by coach Terry Reade, made the dais for valuable medals and team points. In both teams middle distance athletes stepped in to fill spots and support the team. Riley Womal continued a big program running a solid 50.63 in the 400m final, joining Jasper in the long jump. Jamieson had a strong, consistent series of throws in the javelin to take sixth place and Isabelle Ewert jumped to seventh in the long jump. 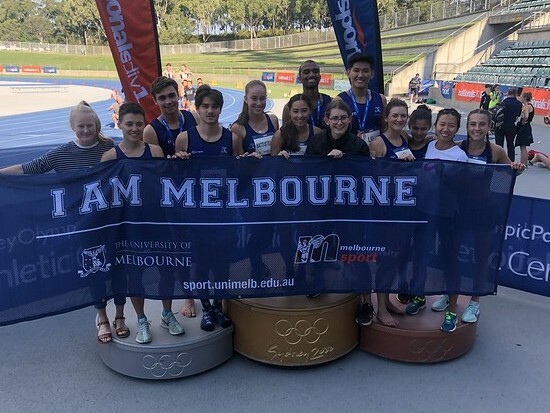 Sunday saw Melbourne University come home strong with two relay medals, some strong performances and a world leading 800m run from Catriona Bisset. Jamieson Battistella continued her good late season form with bronze in the shot put. Cass Wang Lecouteur collected more valuable points with 6th in the 200m final. Ciara Boyd Squires Long fought hard for bronze in the 5000m with Liselle Atkin running well for 6th place. Catriona Bisset stunned the meet with a solo 1:59.78 800m to become the fastest Australian woman in more than 10 years and the 2019 world lead in the 800m. Chui Ling Goh had a strong run to take another valuable 6th place. Bisset and Goh backed up just an hour later with Cass and Kat Anderson to win gold in the 4x400m, running an impressive 3:48. The MUAC men were running off fumes but stepped up with Dhilan, Jasper, Stephen and Riley holding off a fast finishing UQ to take bronze. Melbourne University took a hard fought second place in the overall competition behind our long term rivals, Sydney. Our women’s team were a comfortable second and drove our overall team score, with the men in a very close battle for the final podium spot, just 3 points from 3rd and finished fifth. Congratulations to the entire team and a big thanks to the Melbourne University Sport team for all the work they did over the four days, and in the lead up.